We all know that many sites will use any method they can to track us, whether it's for legitimate reasons that make our experience a better one or for evil reasons like advertising data or just keeping an eye on us. 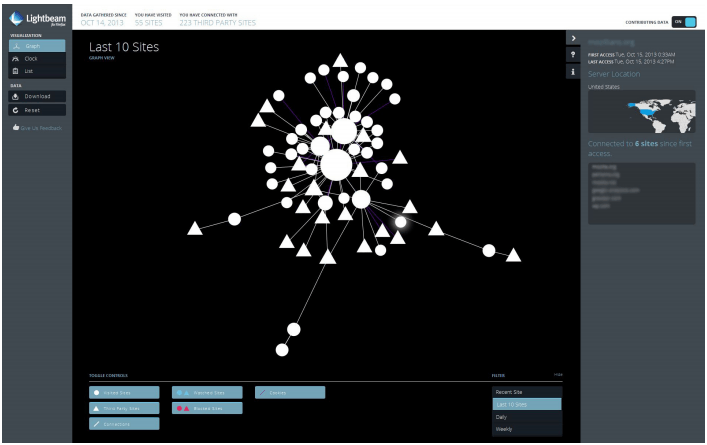 That tracking data can become woven in a large web of connected sites and now Mozilla has released a new add-on for its Firefox browser that will visualize this process as it happens, logging sites that are tracking you and how those entities are connected to other services/tools. The new add-on is called Lightbeam, it functions as a Firefox plugin and will put a name to the faces that are tracking your browsing history. The add-on, which is based on the experimental Collusion extension, will not only track first party sites but it also allows you to see third party tools and other forms of tracking technology connected to those sites. It provides three view modes to display the data, including Graph, Clock and List. It will allow the user to examine tracking data over space and time. More importantly it will identify where they are connecting to your internet activity and provide ways for users to "engage with this unique view of the Web." From there, the add-on also has some sharing options where users can feed their data (or parts of it) into the Lightbeam database, which is attempting to piece together a more global picture of how different tracking elements work online. Lightbeam is available now for Firefox. So far user reviews have been positive with a 4 out of 5 rating on Mozilla's download page. It requires Firefox 19 or later (current version is 24.0), head over to Lightbeam's compatibility page for more information.